Our public schools are rising, our kids are getting good support and, with our community’s help, our students can go even farther. It’s up to us to support our neighborhood schools so they can build on their success. We already have respected indigenous organizations and leaders, dedicated teachers and administrators and involved parents who are leading that change. I am proud to say that I am one of them. Consider what’s happening at Carver Elementary School. My organization, 100% College Prep, is partnering with Umoja, a group that works with African American young boys at recess and after school. They focus on character, history and culture, and stress the importance of education. What they’ve seen at Carver is that with their support, behavior issues went down while attendance and minutes in the classroom went up. In addition, math scores have gone up in the school overall. These are the kinds of programs we want to see more of in our classrooms and community. Parents should know that Carver has a lot to offer. Not only has it been renovated, it has a Wellness Center staffed by social workers, a computer lab where students learn to code, a light-filled library with a teacher-librarian, and a full-time family liaison – who is also a former Carver parent and current co-chair of the district African American Parent Advisory Council. Its principal, Emmanuel Stewart, is a San Francisco native and Bayview resident who has become an inspiring and well-respected leader. At another local elementary school, Malcolm X, parents tell us their kids are well cared for. Eighty percent of its students are reading at grade level. There is outside play and learning, with a newly renovated garden classroom and recess playtime organized by Education Outside. Students can take music, dance, theater and arts in partnership with community organizations, performing in a showcase at the end of the year. There are counseling and health services at the Wellness Center, and each student is served three meals a day. Students can attend an on-site afterschool program and each child is learning to code. More funds will flow into this school with Community Schools grants. Our public schools are rising, our kids are getting good support and, with our community’s help, our students can go even farther. It’s up to us to support our neighborhood schools so they can build on their success. At Willie Brown, their Black Student Union just won first place in the statewide Black Minds Matter competition and Jaiden, an eighth grader, just created a theme song for his newly built school. A STEM school with a robotics program, it offers project-based learning and it’s dedicated to nurturing student leadership. All students not only take science and math, but also coding and app development. Visual art, instrumental music, ethnic studies and Spanish are also offered. In addition, SFUSD Bayview schools are a network offering each student: health and wellness services, small classes, family resource centers, staff and leadership from and deeply committed to the community, afterschool and summer school, and a focus on culturally responsive and empowering pedagogy that values and leverages the cultural assets of our students and families. It’s clear that we don’t need new schools in the Bayview; we need investment in these schools and innovative community programs. I’d like to see more nonprofits in health and wellness, educational support and academic help – elements of what is called a Community School. These include groups like Urban Ed Academy, which supports elementary and middle school boys in STEM education and runs an afterschool program at Malcolm X; the 3rd Street Teen Clinic that works with children suffering from adverse childhood experiences (ACEs) and trains peer facilitators around health and wellness; and the Hunters Point Family–Girls 2000, which supports students and families who live in public housing, with a deep knowledge about trauma and building restorative practices. It’s clear that we don’t need new schools in the Bayview; we need investment in these schools and innovative community programs. These are groups that are from our community. People from the outside can bring fresh eyes but should come with deep knowledge and expertise about our community. One such example is the SF Alliance of Black School Educators who bring representatives of the historic Black colleges to San Francisco for students to meet. Most importantly, these organizations put their resources and support into our Bayview public schools. And those resources are about to grow. SF Unified has identified schools in the Bayview to receive additional resources as part of the new superintendent’s PITCH plan. In addition, San Francisco is allocating more than $200 million over three years to expand its Community Schools model to 27 more schools – including Bret Harte, Carver, Drew, Malcolm X Academy and Willie Brown Academy in the Bayview. Each school will offer wrap-around community services, expanded curriculum and community involvement – a great investment for our local schools. Yet some naysayers, paid by outsiders from Silicon Valley and other states, are telling us our schools and students are failures. They want to open their own schools and occupy our buildings. Their attitude is negative and damaging. No one is saying our schools are even close to perfect, but those of us who live here know there are very strong signs of improvement. I’m in favor of parent choice. If you decide you want to send your child to a private school or a charter school, that’s your decision. But I urge parents to visit and experience our neighborhood schools for themselves. And consider that charter schools take our taxes, take away space from our schools, and run schools that are not accountable to us. It’s not right that our students suffer when resources go to charter schools. In fact, KIPP Bayview Elementary wants to push into Malcolm X next year, likely taking over just those spaces that support the school’s most vulnerable children to do much better. This year they’ll be taking over the garden and art classrooms; later, it could be the Wellness Center. We can be proud of our students in the Bayview. With our support, they will rise higher. Our community can build on our strengths – and support what we, ourselves, know how to do. We are the Friends of Bayview Public Schools – come to Facebook to check us out! 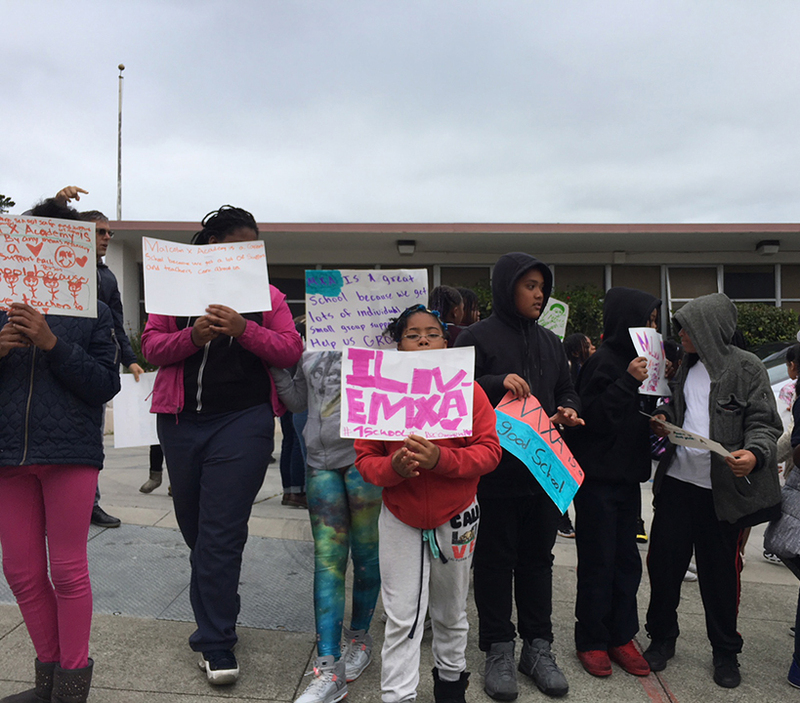 Malcolm X Academy students went on a neighborhood “Walkathon” on Thursday, May 24. These third, fourth and fifth graders wanted to get the news out about what they love about their Bayview elementary school, a tightly knit community of educators and families. At the Walkathon, 40 energetic students and school staff climbed up and down nearby hills, huffing and puffing for about an hour, handing out information to neighbors. For the past few years, MXA has seen strong growth in both math and English test scores – with 80 percent of their school now reading at grade level or beyond. Teachers say that more than that, their Wellness Center, outdoor garden classroom, literacy support, and art, music and dance offerings show the school’s support for each student’s growth. There is also an onsite afterschool program and children receive three meals a day. Some MXA staff and teachers are concerned that those interested in promoting their own, non-public schools are mistakenly pushing a negative narrative – saying that MXA students and school are failing and there’s an emergency in the Bayview. Chris Moore, MXA fourth grade teacher for 11 years, has many positive things to say about the school. MXA staffer Karey Fenderson, SFUSD Prevent Team therapist, hails from the Bayview, having grown up there. Fenderson provides one-on-one counseling, group counseling, and even “lunch bunches” where small groups of students have some informal time to just chat about basketball, social media and whatever, just to relax and have fun. Teresa Bryant, a paraprofessional, has worked at MXA and Bret Harte for the past 13 years. She still keeps in touch with many of her students, including as far back as her first kindergarten class. She marched right along with the students, taking photos as the school’s unofficial photographer. Journalist and communications consultant Melissa Daar Carvajal can be reached at melissa@mdcconsulting.net. Tell me again how charter schools are gentrifying neighborhoods when mostly Black and Brown kids attend them? I’m a KIPP Bayview Academy parent-we live in Visitacion Valley most of the kids in attendance at KIPP are from Vis Valley and Bayview. One of the appeals of the school was that my child could look around and see people that look like her, but who’s parents are mostly like-minded & involved in their children’s education and therefore, it’s not “off the hook”! IDK where y’all are getting your information from (actually, yes I do) but, you’re being lied to. We aren’t coming from somewhere else. You’re fighting your own neighbors and their children. It’s the greedy elected “officials” that have you believing that KIPP kids are from other neighborhoods coming to gentrify our communities. Not true. Is KIPP perfect? No! But it is a far better choice than I have had with public schools. My daughter has been bullied by teachers, placed in a diaper in front of her peers for sucking her thumb in circle, snatched by the collar and kicked in the behind by a principal. When she complained and I addressed it, she was taken in an office by the same principle and intimidated into changing her story. Now when she has a problem she doesn’t feel like she can turn to any of the school staff-the people I sent her to and taught her to trust. DAMAGE DONE. The real truth here is, these greedy elected “officials” and the upper eschelon of the Teachers Union (the elites) want you to focus your anger at the Charters (who have already sent so many of our children to colleges) instead of having us angry at them for their lack of response and action. Imagine if KIPP or any other Charter hadn’t presented itself, what then? Would SF be better off? Don’t be fooled by this Cartel. Monopolizing our Children’s Education (or lack of). They get money from the same billionaire playboys they accuse the charters of dipping into. It’s all just misdirection. Open your eyes! I’m glad Malcolm X is doing better, but it’s just ONE school-that’s hardly a sign that this failed system is back on track when so many are still failing-but as long as one school is better than another, I want parental control (choice) over my child’s education. I retain the right to send my child to wherever I feel suits her and supports her the best. You can’t be angry at us for wanting the best for our kids.